Case-6667 - Patrick Sullivan, M.D. 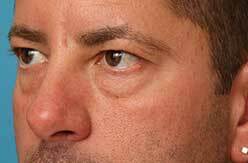 This is a 43-year-old man who also has concerns about the puffiness and circles around his eyes. People at work were asking him if he was “tired” and “getting enough sleep”. 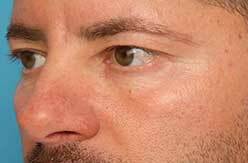 Treatment of the lower eyelid and cheek involved an incision hidden on the inside of the lid so there would be no visible scar. The puffy tissue was repositioned to fill in the circles and the upper part of the cheek. Some of the excess tissue was also removed. Our emphasis was on achieving a natural appearance so that no one at work would know that he had surgery; but rather, we hoped his colleagues would think he was just well rested.